Is the UK a safe haven for piracy? 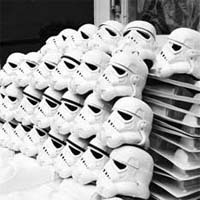 Well, so says Lucasfilm as they lose in the English Supreme Court against one Andrew Ainsworth, the original prop designer who manufactured the imperial Stormtrooper suits for the first Star Wars movie. Now Mr Ainsworth is free to sell his Stormtrooper armour to one and all, a point George Lucas is not happy about. I have mixed feelings about this ruling, but have to presume that the jury and judges who had access to all the points of the case have made the right call. So what do you think? I know the David vs Goliath thing makes for a great story – and I’m sure the movie (or the TV show) of the fight will be made at one point – but does Ainsworth have the right to trade in on the success of the Lucas movies or not? 15 years? I didn’t know that. Hmmmm. Given you can buy these suits online in the USA for shipping from the UK, I wonder if U.S. customs might try and impound them, now? I believe he stopped shipping them to the US following a US court ruling some time ago. Also, all copyright eventually expires. that’s why it’s free for the BBC to play old school classical music when the service goes down; it doesn’t cost them anything in royalties. The Beatles (and their estates) keep applying for extensions to their copyrights, I believe, since they’re all starting to run out now. As far as I’m concerned, if this guy was making money selling data (like, the soundtrack, the films, etc) then I’d have more of an issue. But he actually makes the suits, an investment of time, money and other things, and I have much less sympathy for people who whine about people selling physical objects than I do abstract things like data, which is cost-free to copy and very low cost to transmit. As long as he follows the original design — and doesn’t MAKE CHANGES WITH EACH NEW RELEASE — then I trust him more than Lucas. More power to you, Mr Ainsworth!